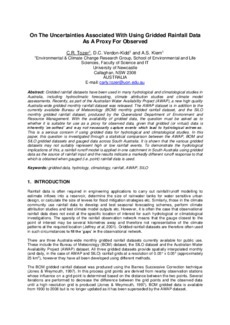 Gridded rainfall datasets have been used in many hydrological and climatological studies in Australia, including hydroclimatic forecasting, climate attribution studies and climate model assessments. Recently, as part of the Australian Water Availability Project (AWAP), a new high quality Australia-wide gridded monthly rainfall dataset was released. The AWAP dataset is in addition to the currently available Bureau of Meteorology (BOM) monthly gridded rainfall dataset, and the SILO monthly gridded rainfall dataset, produced by the Queensland Department of Environment and Resource Management. With the availability of gridded data, the question must be asked as to whether it is suitable for use as a proxy for observed data, given that gridded (or virtual) data is inherently ‘smoothed’ and may not necessarily capture events which lead to hydrological extremes. This is a serious concern if using gridded data for hydrological and climatological studies. In this paper, this question is investigated through a statistical comparison between the AWAP, BOM and SILO gridded datasets and gauged data across South Australia. It is shown that the various gridded datasets may not suitably represent high or low rainfall events. To demonstrate the hydrological implications of this, a rainfall-runoff model is applied in one catchment in South Australia using gridded data as the source of rainfall input and the results indicate a markedly different runoff response to that which is obtained when gauged (i.e. point) rainfall data is used.